When I finally woke up a few hours later, I saw some ice sticking in a few places, but the roads still looked relatively clear. 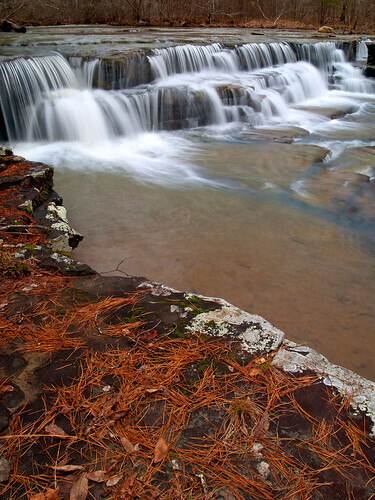 I tried to decide on heading off somewhere to take pictures, and debated whether I should drive up to Collins Creek for some snowy waterfalls. 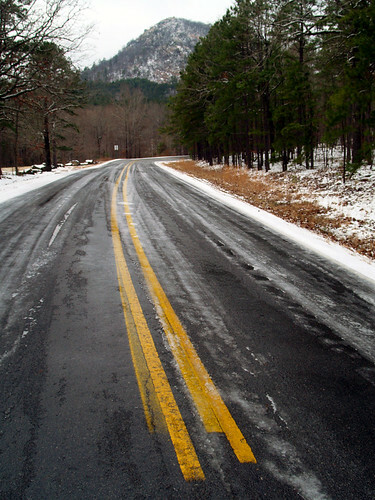 But I heard that the roads had gotten a bit icy around Conway, and it would be wiser to not make any long trips on slick roads. So instead I headed out to some places closer to home. 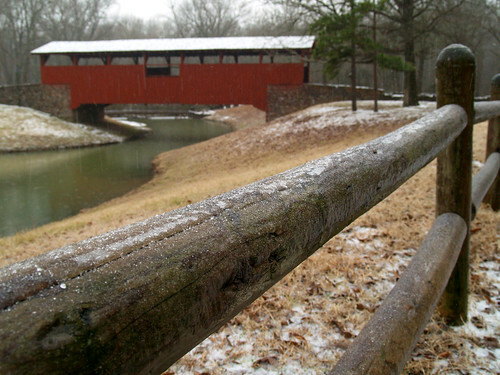 After spending twenty minutes clearing off the ice from the car, I headed out to Burns Park in North Little Rock. Ice was beginning to accumulate on the roads, but it wasn't bad yet in the park. 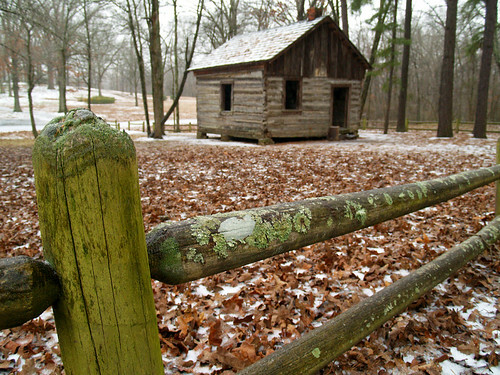 The first stop I made was at the old cabin which was built before the Civil War. It was sleeting, and the tiny ice pellets were sticking to the road. I didn't think I'd be able to get much more time in before the roads got bad. 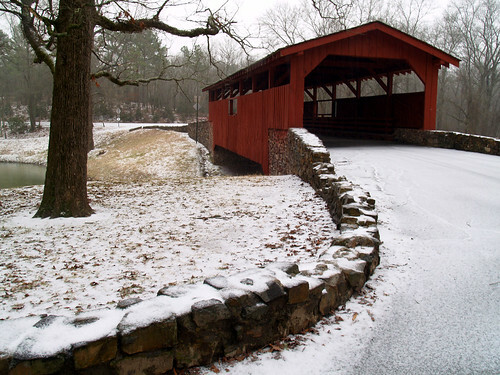 But I figured I'd have time enough to make a quick visit to the covered bridge in the park. I tried to leave the park, but drove up to a locked gate. I drove a bit further down, past the funland and rocket slide and hit another locked gate. It dawned on me that the gates into the park might have been locked on me while I was at the bridge. I saw a number to call on a pavilion, and just got the voice mail for the NLR Parks and Recreation Department. There was only one other way out, and I hoped the gate there wasn't closed as well. Luckily, it was open and I made a quick escape. I decided I would try to visit the Old Mill in North Little Rock too, which was riskier since the area around the mill has a lot of hills. I drove up J.F.K. Boulevard and saw cars already sliding around, with the police blocking off some of the more hilly portions of the road. Luckily I was able to drive up to the Old Mill, only to find the gates there locked as well. With my attempts at photography thwarted by the NLR Parks and Recreation Department, I instead drove over to a friend's house. 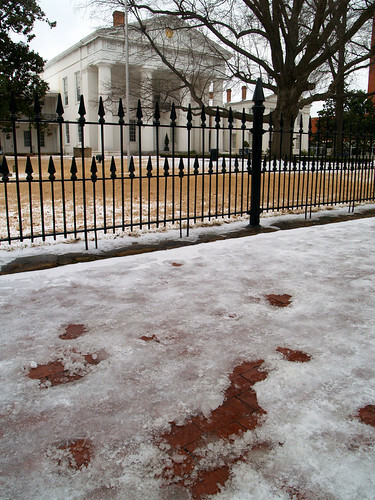 As it got dark, the ice accumulated more on the streets. It was perfect sledding conditions, and we spent some time sledding down some hills in Sherwood. The ice had turned over to snow that night, and we ended up getting about an inch and a half of ice/snow. 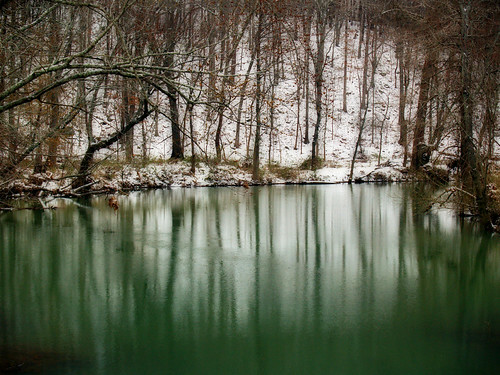 We went sledding a few more times, but then I set out to try to get some pictures before all the ice melted away. Since I was in Sherwood already, I drove out to the old Roundtop gas station. The road to the station passes by a wetlands area. 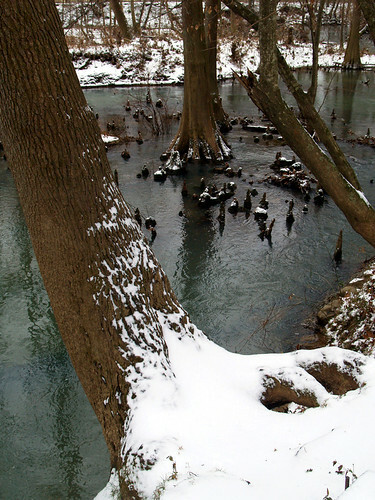 The water was covered in a sheet of ice, and snow clung to a few of the trees. 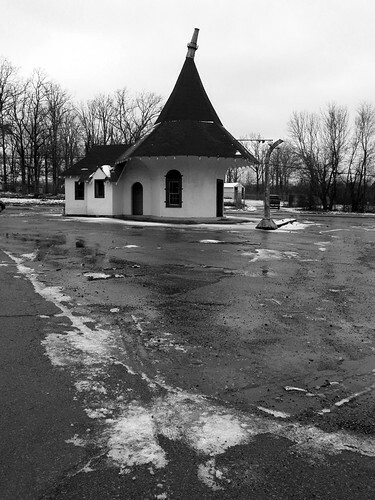 And a shot of the old Roundtop station. I hoped there would be more ice or snow there, but it had already been cleared out or melted. 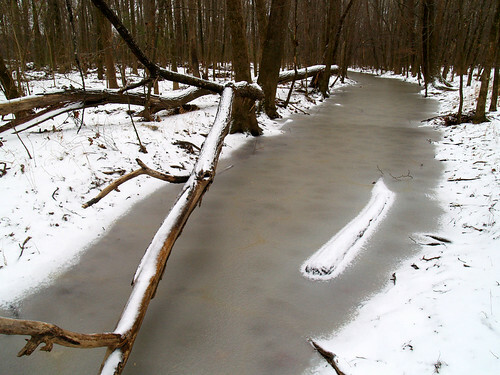 It had gotten above freezing, and all the ice was quickly melting away. That made the roads clear, so it wasn't bad when I drove into downtown Little Rock. I stopped at the Old State House, only to see that the gates there were chained shut as well. Judging by footprints in the snow, it didn't seem like many people had walked the trail that day. There were more animal prints along the trail than people prints. 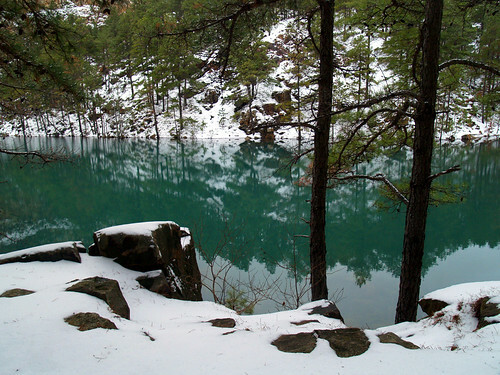 The Kingfisher Trail is a pleasant place to stroll, especially in the quiet snowy landscape. 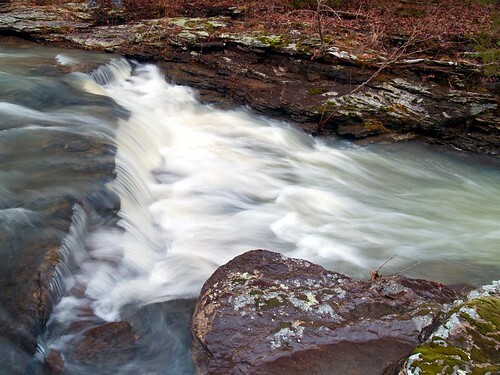 The trail runs alongside the Little Maumelle River. 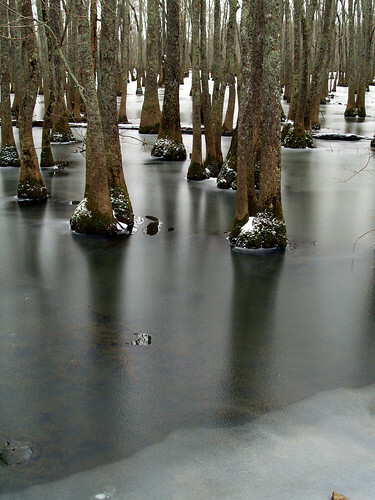 The Little Maumelle River flows just past the base of Pinnacle Mountain, where several old cypress trees sit along the shore and in the water. 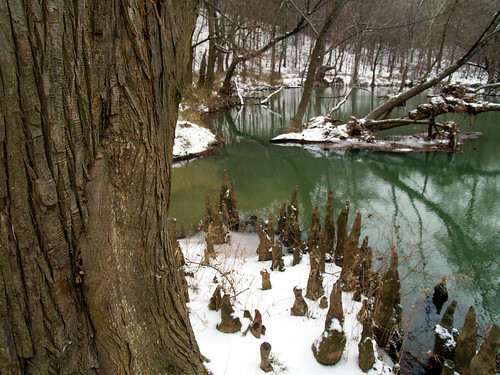 And a closer view of the cypress knees. Check out the debris stuck in the tree in the background. That probably got put there when this area flooded on Christmas Eve. And a view of Pinnacle Mountain. When I was there some people parked and started on the trail to head up to the top. And another view of the mountain, from the park road heading over to the visitor center. 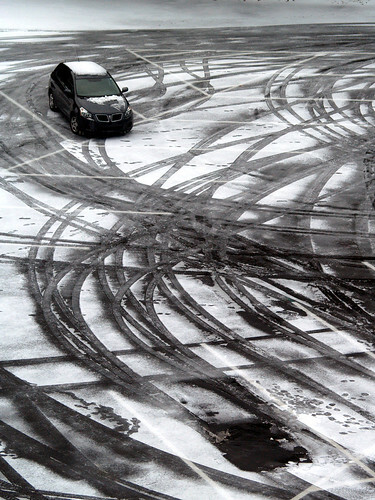 It wasn't all that icy, and I only slid once that day (and that was turning into my apartment complex). 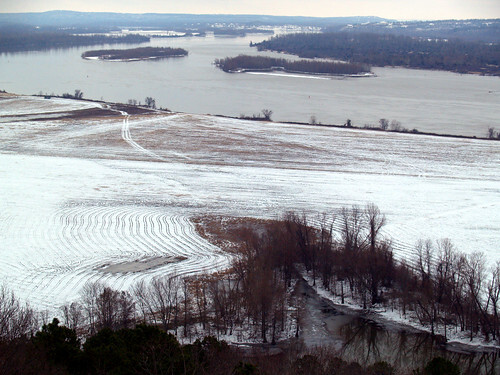 I went up the overlook, which provides a sweeping view of the Arkansas River and some snow-covered fields. Also from the parking lot, I got this shot of the mostly empty and snowy parking lot. Last Saturday morning I woke up early and met up with Matt Kennedy and Zack Andrews (and his girlfriend Caden) in Conway. 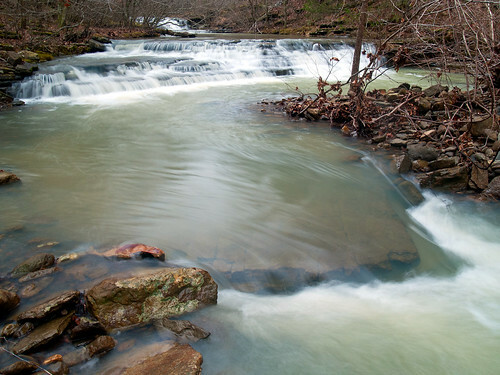 Our destination that day was a little-known and probably seldom visited area in the Ozark National Forest called the Blue Hole. Not too many people know about this area – it isn’t listed in the main guidebooks, there are no signs for it, and there isn’t a trail. To get there involves driving down several miles of dirt roads, and then a bushwhack through the woods. But it’s definitely worth it. 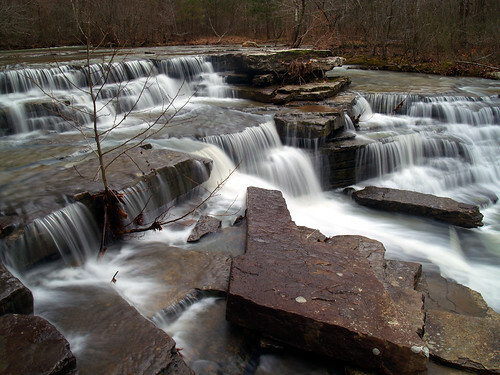 The Blue Hole area has two creeks that each have some spectacular waterfalls. To get there, we drove north from Morrilton, eventually driving through the small town of Jerusalem. Now I wasn’t driving, and spent the drive in the backseat not paying attention to the directions. But we turned onto a muddy dirt road that quickly headed up a hillside that was shrouded with fog. Visibility was low, which made the narrow dirt road much more interesting. On one side was a steep drop-off, with the distant ground hidden beneath the foggy abyss. We turned onto another dirt road, and followed it for a bit before stopping to park. We continued to walk further down the dirt road, which became increasingly muddy. There were patches where the road was replaced with deep puddles, and the mud was the type where your foot would sink in halfway and the mud would clutch onto your shoe and try to steal it. After reaching a camping area, it was time to bushwhack. 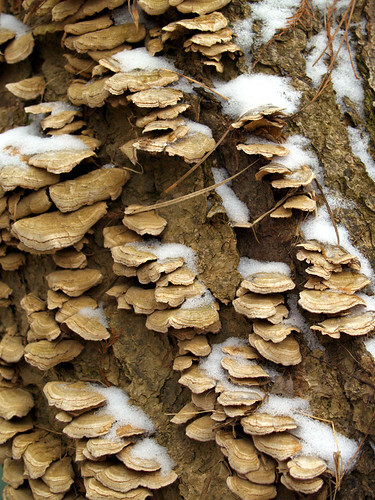 It was very easy at first – it was a flat and easy walk through a pine forest that was free of any damage from last year’s ice storm. But soon we started heading down a steep hill, but at least it was scenic. 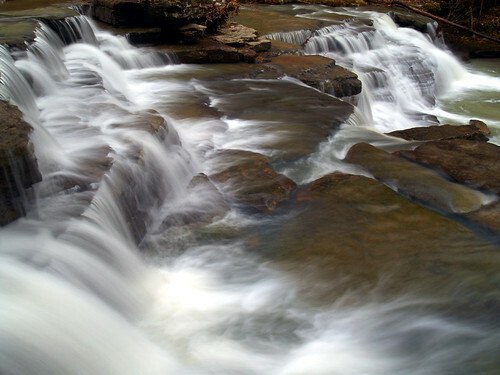 The way we chose was next to a small creek that had a few waterfalls on it. 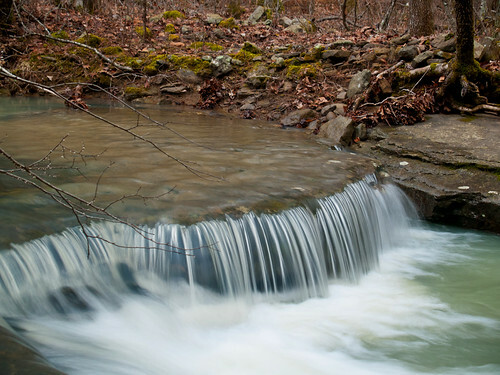 Eventually we made it to the first creek, and quickly found this small waterfall. 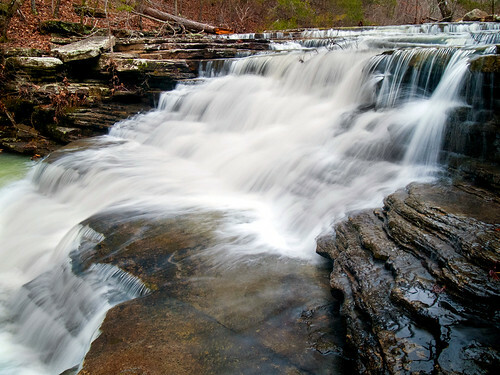 After crossing the creek, we then came upon the first of many great waterfalls there. I walked back along the creek to where Matt and Zack were standing. It was there I heard the tragic news that Matt's camera had taken an unfortunate tumble into the creek, and had gotten soaked. Luckily the camera came back to life after being dried out (Matt's Pentax shall henceforth be referred to as "zombie camera"). 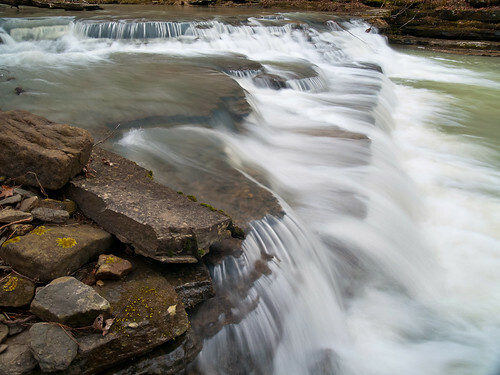 But the creek with the waterfall shown above flowed into another creek, which had a lot of great waterfalls on it as well. This was a neat little area just above the spot where the two creeks met. 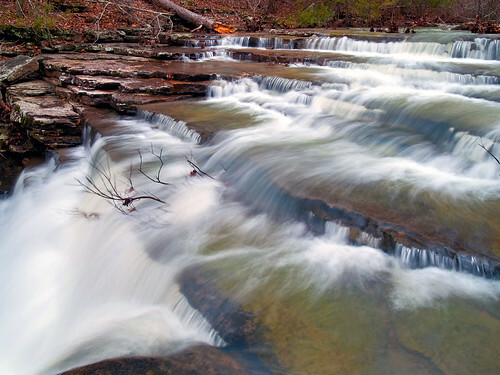 It's amazing that this place isn't more known, since there are so many great waterfalls. Just above this spot was what might be the neatest part of the creek. 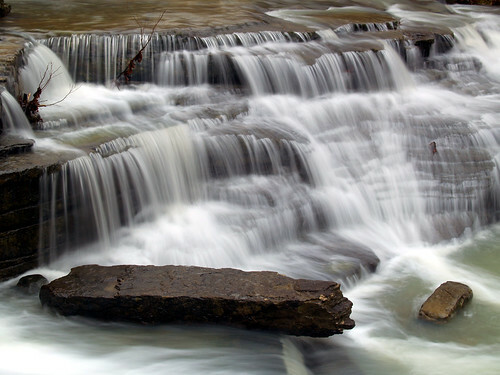 A waterfall stretched along the entire width of the creek, with water jumping and cascading over several huge rocks. Most of the trees around here were pines, and the fallen pine needles provided a touch of color. I felt bad for Matt, who had to sit and watch while we were taking pictures. I tried to make him feel better by saying that all my pictures were going to turn out crappy. I don't think it helped. 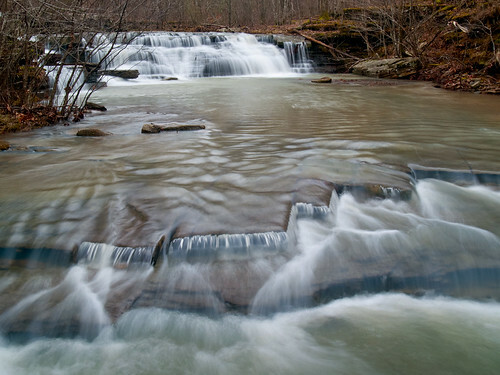 There are other waterfalls along this creek, but we didn't have time to explore more. That was my fault, I needed to be back in Little Rock by 2:00 that day. So we headed back, but not before getting one last shot of the falls. After crossing the creek, it was time to climb back up the hill. It was steep, and slow-going. It was a painful reminder that I've let myself get way too out of shape. I guess I need to do some more hiking to burn off the beer belly. 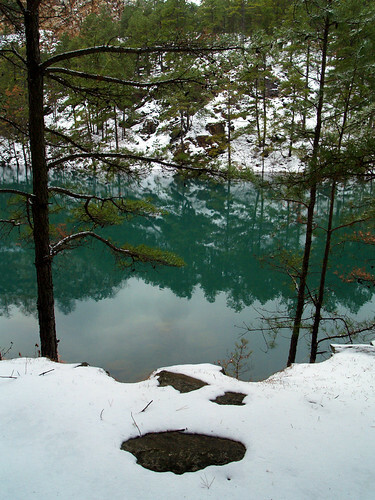 But the Blue Hole was added to the list of places that require several more return visits to explore further (that list is growing longer and longer). Next, I headed south along Hwy. 1 and eventually met back up with Hwy. 65 at the town of McGehee. The road went past a park next to a small lake filled with lots of cypress trees. There was even a nice little boardwalk to head out on to get a better view of the trees. I decided to stop, since I don't know the next time I'll be in McGehee. And also, with it being winter, I wouldn't be feasted upon by a swarm of mosquitoes. 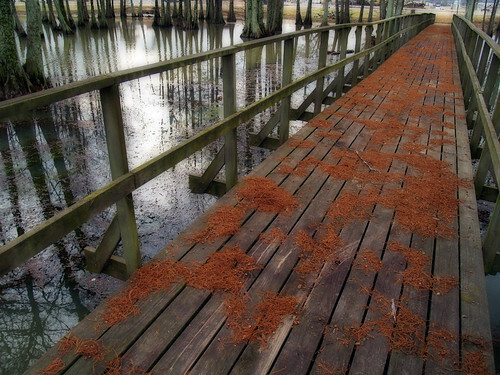 The view of the boardwalk, decorated with the fallen leaves from the cypress trees. The next stop was Lake Chicot, located by Lake Village in the very bottom corner of the state. When I was growing up, we used to drive down Hwy. 65 while heading to Florida to visit relatives. Since this was way back before cars were equipped with DVD players, my brother and I had to occupy our time by keeping track of several landmarks along the way. 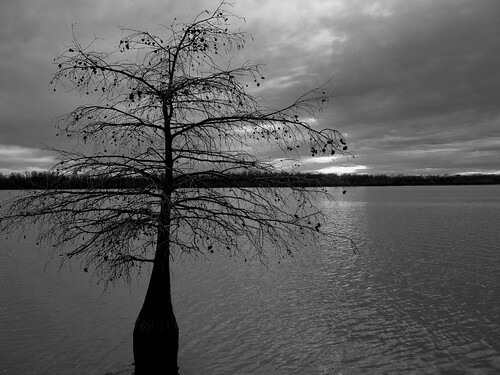 Lake Chicot was one of those landmarks, with old docks running out into the lake and thousands of cypress trees standing tall in the water. Some other important landmarks along the way: the sign by the state prison in Varner that warned against picking up hitchhikers, the tunnel at Mobile, and the town of Transylvania, Louisiana. 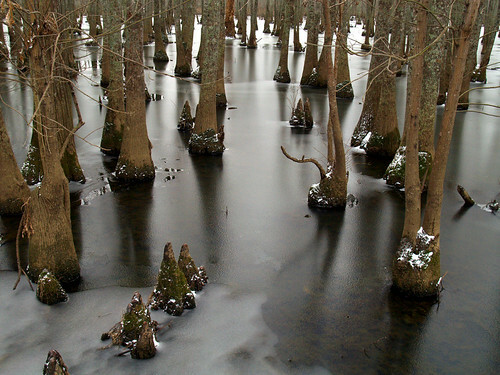 But Lake Chicot is huge; it’s actually the largest oxbow lake in North America. 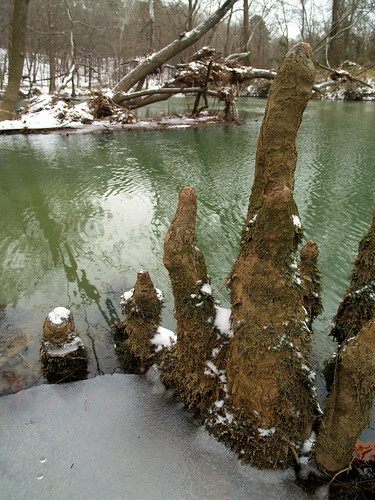 About 600 years ago, the lake was once part of the Mississippi River. 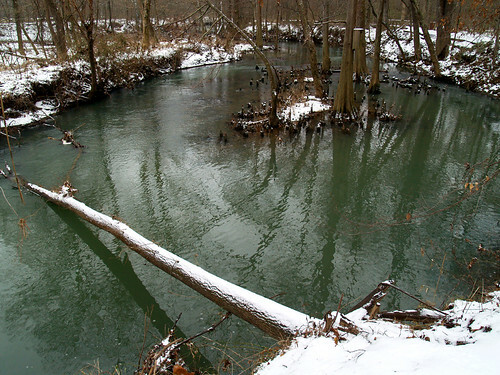 But changes in current meant that this part of the river was cut off, forming a lake instead. 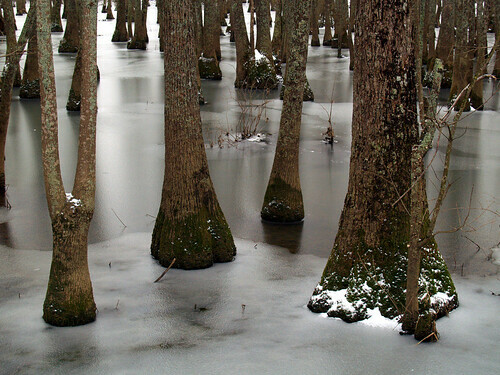 Now the lake is home to countless cypress trees that dot the landscape. 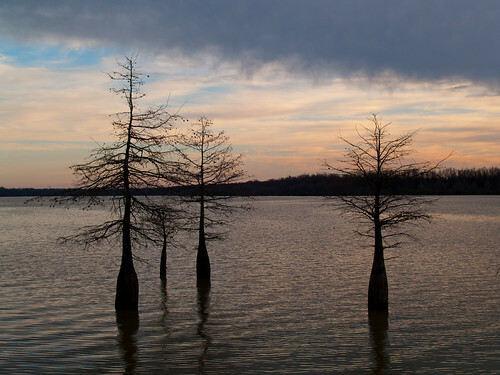 Actually, Lake Chicot got its name from the French word for “stumpy,” which was inspired the cypress trees. These were all taken at the state park along Lake Chicot. It was a bit late in the day when I got into the park, and I stopped at what seemed like the most promising place. 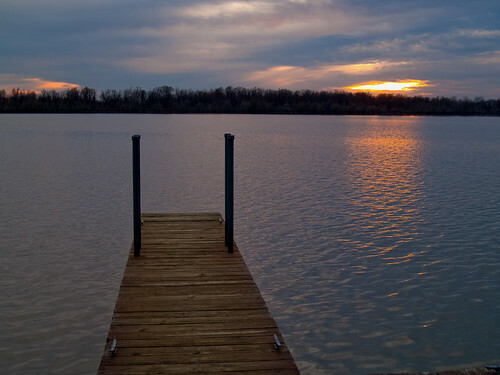 It was along a dock, with a view looking off towards where the sun would soon be setting. I sat out on the dock and waited for the sunset. It was hard to see the sun for the most part; it was hiding behind the clouds. But since it was so cloudy, I predicted that the sun would just merely set behind the clouds without any nice color to show for it. So instead of waiting 30 minutes for the sun to finish setting, I gave up on it and started to drive on home. As I was heading back up Hwy. 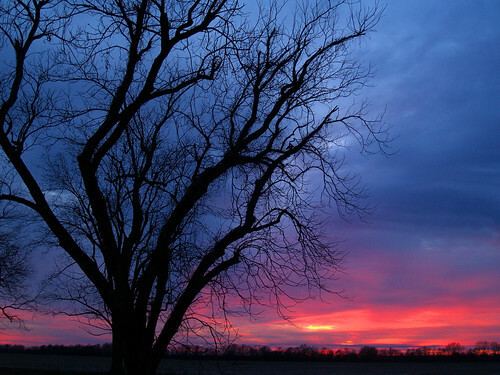 65, I saw (to my surprise and dismay) that there was actually an awesome looking sunset developing of to the West. So I ended up trying to desperately find a place to stop for a shot. Trying to not miss the best light, I turned off of Hwy. 65 south of Dumas and hurried down a dirt road by some fields. Eventually I found an old tree by the side of the road and quickly pulled over to get a shot of it silhouetted against the sunset. The great light only lasted for about 2 minutes after that. So it was time to finally head back home - after about eight hours of driving where I travelled over 300 miles and used up one tank of gas. There is a great amount of history situated around the small town of Rohwer. But like Arkansas Post, most of that history has been lost and there is little to show for what took place here 65 years ago. 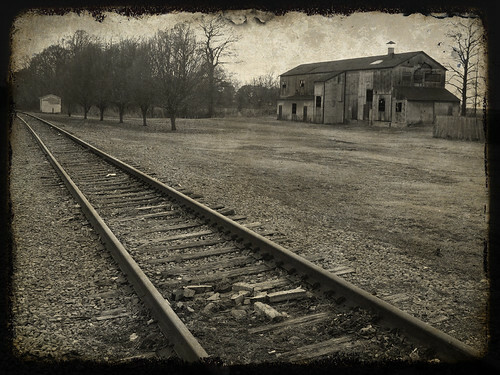 Although Rohwer now looks like a typical small town, it was vastly different during World War II, when it was the setting for one of the darker chapters of recent US history. In 1942, President Roosevelt established the War Relocation Authority for the "relocation, maintenance, and supervision" of Japanese-Americans. The WRA built ten relocation camps, with the majority of them being located in Western states. 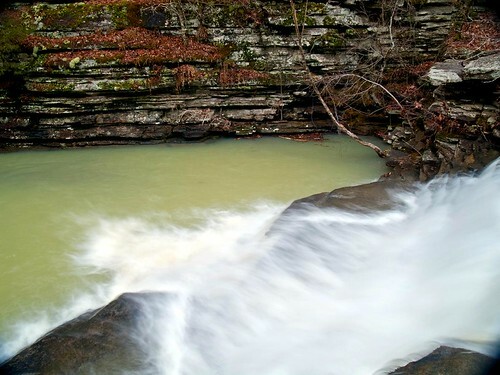 But two sites were selected in Arkansas, one by the town of Jerome, and the other one in Rohwer. 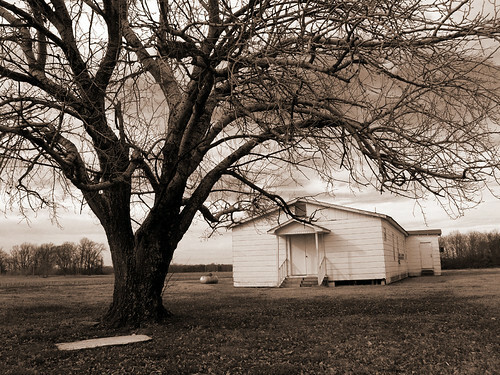 The camp in Rohwer was situated on over 10,000 acres of land, which included the barracks for the relocated citizens, and buildings for schools, health care, laundry and even a cinema. The Rohwer camp operated from September 1942 to November 30, 1945. The highest number of people recorded in the camp was in 1943, with 8,975 people living behind the barbed-wire fences. Among that number was George Takei of Star Trek fame, who lived there in 1942. The state of Arkansas was not pleased to have the two camps here. In 1943, the state legislature passed a law meant "to prohibit any Japanese, citizen or alien, from purchasing or owning land in Arkansas." While that law was ruled unconstitutional, the governor at the time was against allowing any Japanese American student to attend college classes in the state. In fact, only one Japanese American student was accepted into a college during the length of World War II. I was a bit pleased to see that the only university in the state to accept a Japanese American student was the University of the Ozarks in Clarksville (my alma mater). At the end of the war, the camps were shut down and the Japanese Americans were finally allowed to return home. 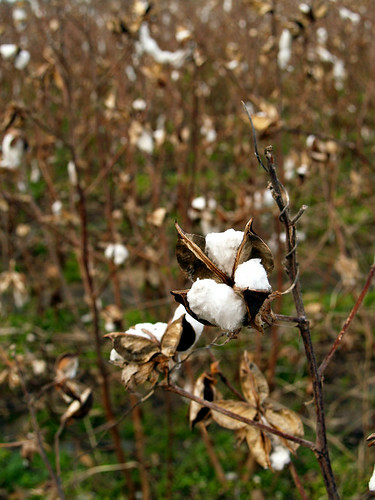 The camp's buildings were torn down, and the land became cotton fields. 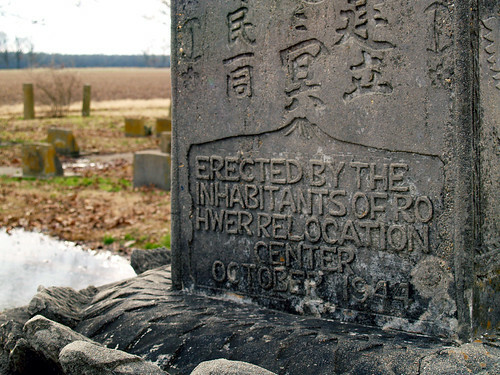 The only lasting legacy of the Rohwer camp is a small cemetery. I drove up to the cemetery, located along a dirt road that was surrounded on all sides by rows of cotton. The cemetery contains the graves of about twenty people who died while at the camps. There are two huge markers. One is a memorial for those who passed away while living in Rohwer. 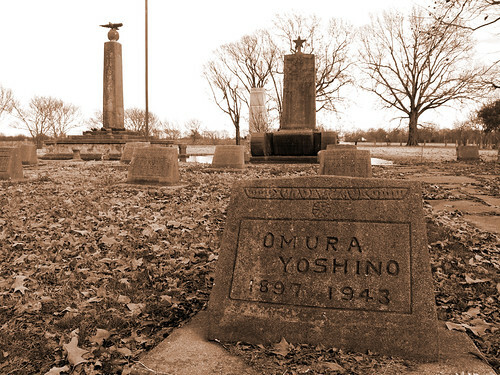 The second one, which is shaped like a tank, commemorates the 326 Japanese Americans who decided to join the US Army while being forced to live at Rohwer. During the war, the soldiers fought in France and Italy. The memorial here is for 31 soldiers from Rohwer who died in battle. 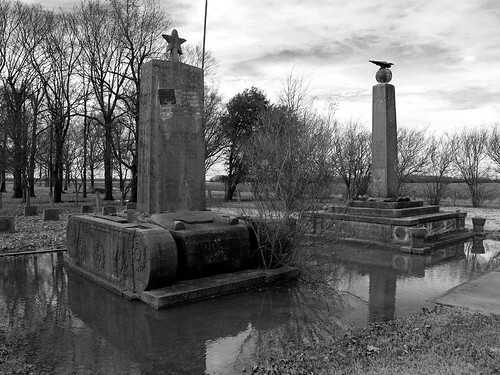 The cemetery became a National Historic Landmark in 1992. 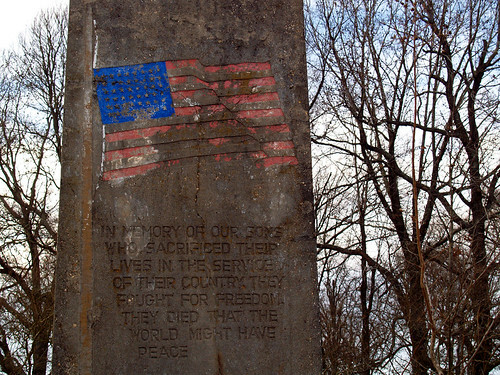 The concrete markers have faded over time, but they provide a somber contrast to the verdant farmland that surrounds it now. 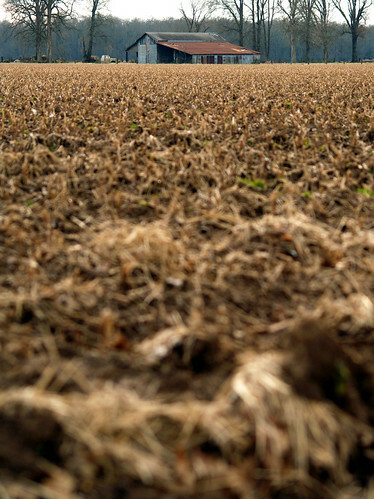 The cotton fields that surround the cemetery seem to stretch on for miles, and there were a few pieces of cotton that must have escaped last year's harvest. Across one of the fields was this old barn, one of the few buildings that you can see from the cemetery. I couldn't help but wonder where the old buildings and barracks of the camp used to be. 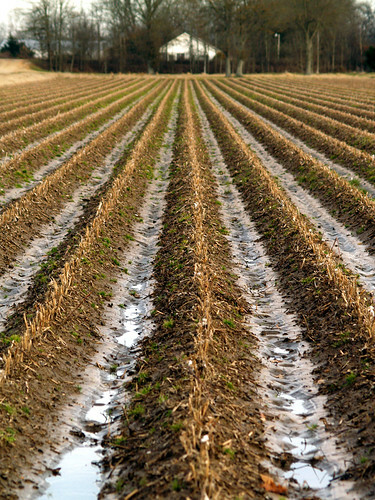 Were the foundations replaced with the rows of cotton? If there wasn't a cemetery here, there would be no lasting trace of the Rowher camp. Rohwer is a place I've been wanting to visit for several years now. My Grandmother was from this part of the state, and worked at the camp during the War. Occasionally, she would tell us some stories about the camp, which I'm sad to admit that I don't really remember all that well now. She worked in the administrative offices, which were generally kept separate from the Japanese population. She needed help making ends meet while my Grandfather was in the Navy, and the relocation camps were one of the few places in that part of the state that were hiring. 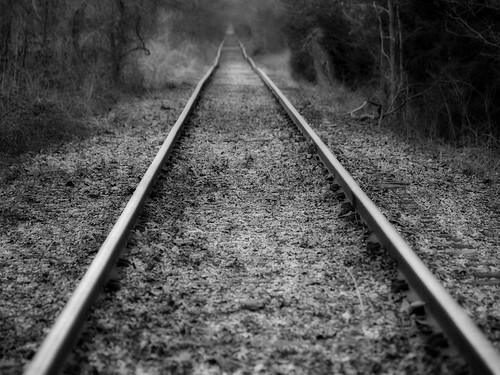 I left the cemetery and headed back to the main road, stopping to get this view looking down the train tracks that must have passed by the camp at one time. The cemetery at Rowher probably doesn't see too many visitors. The markers there are faded, the concrete reflecting the 65 years that have passed since the camp was in operation. But for all the activity and humanity that was placed here, the cemetery and its weathered markers are all that remain, surrounded by fields of cotton. From Arkansas Post, I drove south on Hwy. 1 past more vast fields. I stopped at this old church, which probably isn't home to many services anymore. Although the church's sign is gone, what's left is still welcoming visitors. The next stop was the small town of Watson. The town just has a population of around 300 now, but at one time was the county seat. 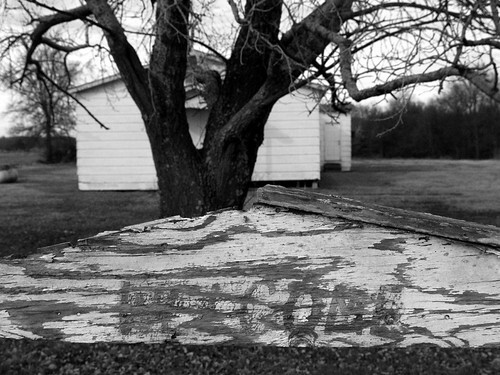 But like most of its neighboring towns in the Delta, it seems to be fading away. This was along the main street in the town's small downtown, just across from the railroad tracks. There was a small cafe next to it, which was open but only for lunches. I was interested in visiting Watson, because my Grandmother was born and grew up there. She moved away after the Great Flood of 1927, heading off to North Little Rock to attend school. It was in a class at North Little Rock High School that she met my Grandfather. I still have some distant relatives that live around Watson. But unfortunately, they aren't among the major families that still live in the city. According to Wikipedia, in a post no doubt written by Tyler Cox: Watson is home to many notable families, none of which is more recognized better than the Cox family. This family has begot a most loved son, Tyler Cox. With the love of his family, Tyler has become one of the most loved people of Dumas Ar. Across the train tracks from the Highway One Cafe is the old cotton gin. I ended up using a texture for this shot (which might be too much, I don't know). (the texture is from skeletal mess on Flickr). 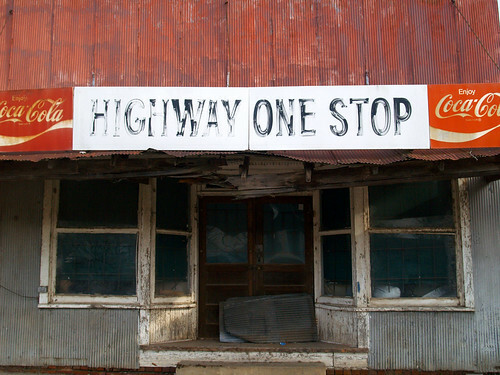 While looking up stuff tonight on Watson, I found something cool about a nearby "ghost town." There used to be a busy little city, called Napoleon, that was built at the intersections of the Arkansas and Mississippi Rivers. The post office there was established in 1836, and people there were optimistic that the town would develop into a major city due to its location by two rivers. 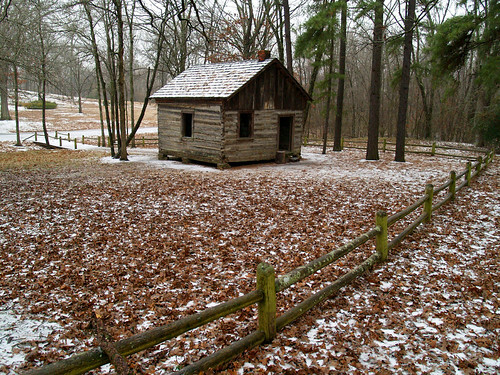 On February 12, 1861, even before Arkansas had voted to secede from the Union, Governor Henry Massie Rector had state troops seize the marine hospital and any ammunition shipments in Napoleon to prevent them from falling into Union hands. By September 1862, Union troops occupied Napoleon, and most of its citizens had abandoned the town. 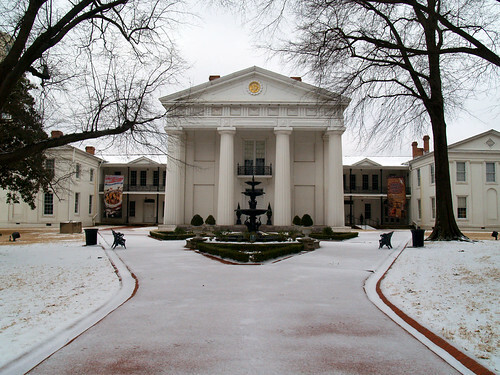 In January 1863, Union soldiers destroyed the county courthouse in Napoleon, using its wood to fuel their fires in the midst of a blizzard. 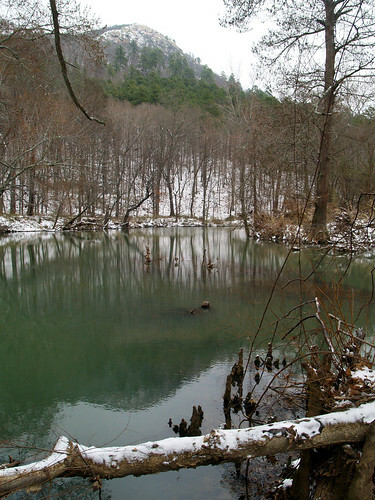 Meanwhile, Confederate guerillas were using the wooded peninsula east of the town as a base to attack Union boats. The main channel of the Mississippi River swung east and then west along what was called the Beulah Bend. The turning was so abrupt that the guerillas were able to use the same cannon to fire on boats as they entered the bend and again when they left it. Lieutenant Commander Thomas O. Selfridge, seeking a way to avoid this ambush point, had the men under his command dig a channel across the peninsula. The work took only a day, since the land was soft, the distance only a few hundred yards, and the current of the river itself assisted their work. In fact, on the day after the work was completed—in the first week of March 1863—Selfridge was able to pilot his steamship, the USS Conestoga, through the new channel. Although Selfridge was only seeking a shortcut around the guerilla ambush, he succeeded in rerouting the Mississippi River, ultimately turning Beulah Bend into an oxbow lake. His work also spelled the end of the town of Napoleon, for the new channel of the river happened to be aimed directly at the town. High water in 1868 caused the marine hospital to crumble into the river. Another flood in 1874 completely submerged what was left of Napoleon. By October of that year, the county government was moved to Watson. The iron church bell once used in Napoleon is now in the Catholic church in McGehee (Desha County). 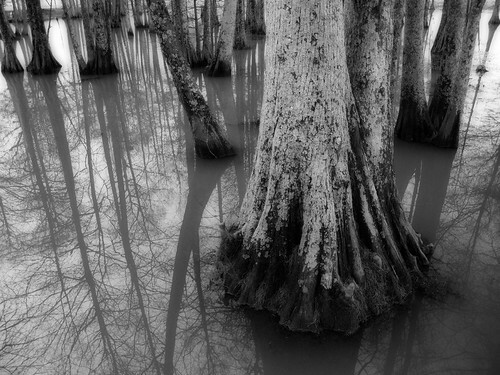 At times when the level of the Mississippi is unusually low—as it was in the summer of 1954—the remains of the town can still be detected in the sandbars of the river.